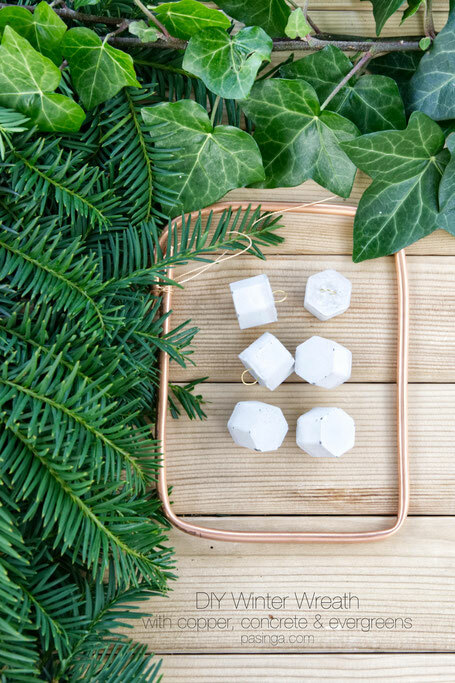 December is here and I am decorating my studio with little bits of green to surround me with some festive mood and coziness. 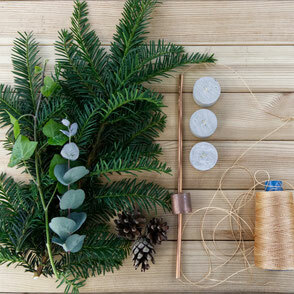 To me Winter, and maybe Christmas, warmth comes from a bit of of evergreens, pine cones, moss and candles but also from a bit of crafting just for myself. 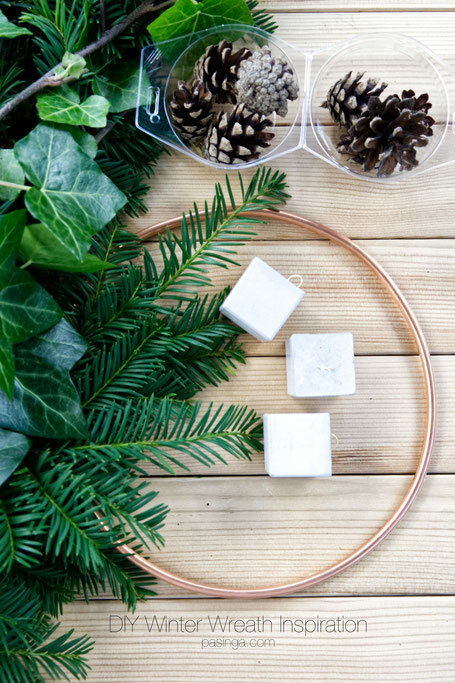 So here we go, a wreath DIY to get the spirits up. 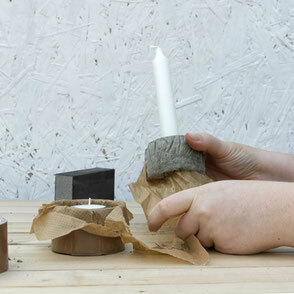 I promise these two are fairly easy and you can incorporate almost anything you are pleased with or cherish the most. 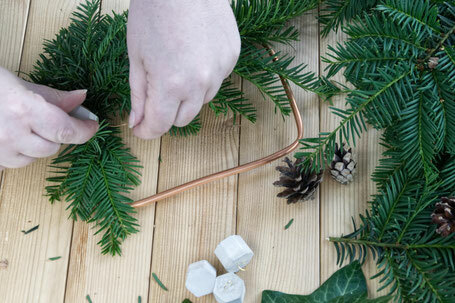 I am using copper coil which I bend over a bucket, about 30cm in diameter, to have a wonderful circular shape for the first one. 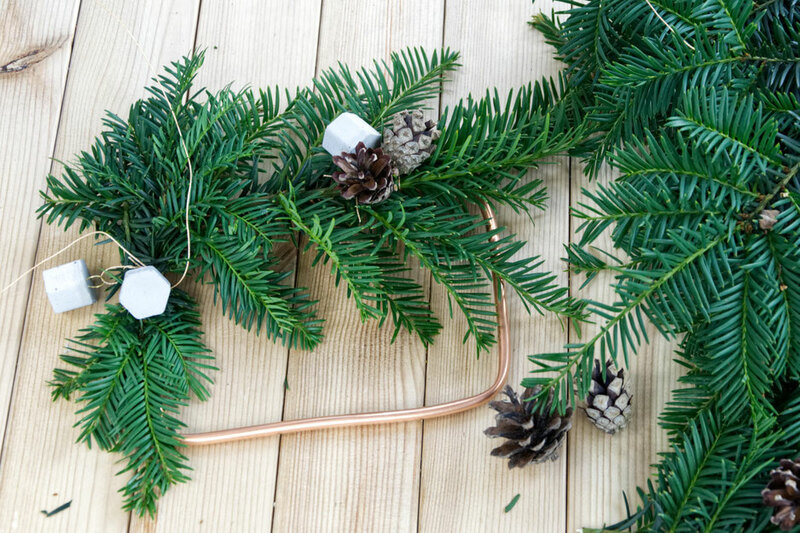 However, you could also use a wooden loop, a proper wreath ring available in a lot of sizes. 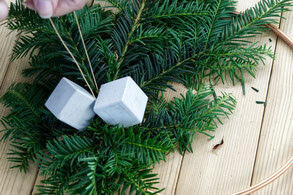 In contrast I am going to use the concrete cube ornament set, some greens and simple dark green evergreens. 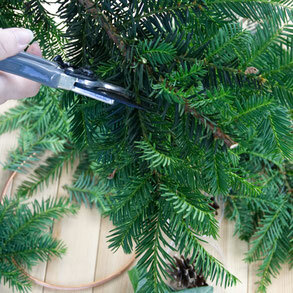 You will also need some scissors, twine or threat, alternatively some wire, and a gardening scissors to trim the greens. Just like the pictures on the left show, I am cutting off some smaller, softer twigs, preferably with beautiful fork like tips of the branch. 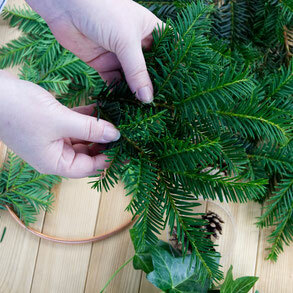 I place them in bundles on top as well as closely next to each other to create volume and attach it to the wreath as shown below. I am using copper coloured nylon threat. I find this more flexible compared to wire and easy to handle. You can attach the green first and cut the threat but I use a long threat on purpose as I will use it to attach some ornaments as well. So I took my bundled greens and placed them to the [when hung] lower side of the ring and knotted the greens to the copper ring. I used the same threat to attach the first concrete cube. It will be centred on and the most tightly fixed one. I went on with the threat through the hanging loop of the ornament and knotted again around the greens as well as the copper ring. I am still on the same threat to attach more ornaments but you can use new string should you need / or want to. On the right is a detailed view of the three concrete cubes attached. I made sure some green would come through in-between to achieve a modern cozy look. 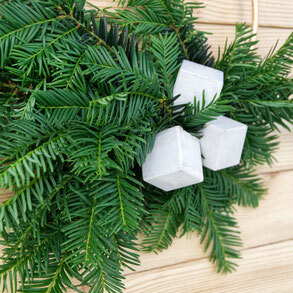 To me this is about right, a wonderfully simple, clean modern winter door wreath. 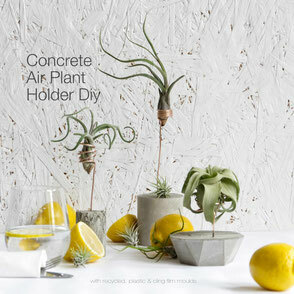 Of course you can add more, it all will also depend where you are planning to hang it. I can also see some dried fruit added, a bow or pine cones. Well, the latter one will feature in my second wreath idea too. Here we go, this is a smaller one, it will be for my card wall with loads of cards and small frames, so I am not looking for something big and overpowering but something which highlights, an accent if you like. So, I roughly bend a left over piece of copper coil around a box. 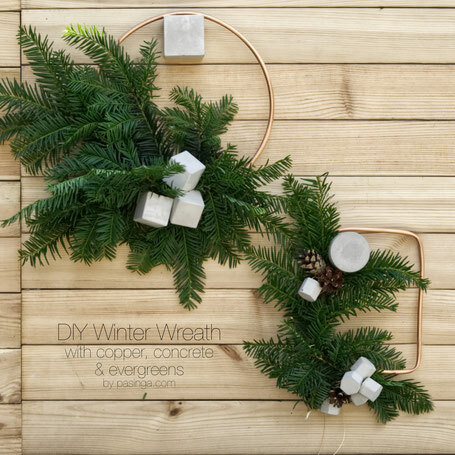 I knew right there that I want one corner of the wreath to be bare copper again. 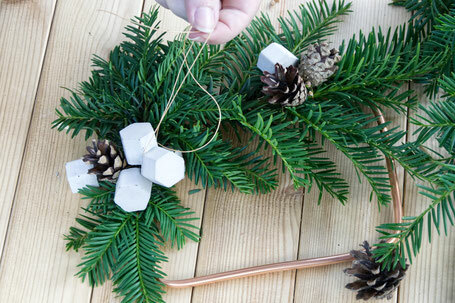 It's the same materials and tools as above but I am using the hexagon ornaments with gold loops and pine cones. 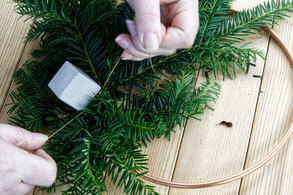 I fixed a bit of fir on a 'L' side to the copper frame and started to attach the ornaments just like pictured above. For this one I stepped back a few times to look at it as I wanted it to hang right but also wanted some bright concrete to the left side too, not just on the [when hung] lower side. Of course you can also use more than a hook to hang this right but I try to avoid that. So to balance the decor I decided to add one concrete ornament to the left along with two pine cones - three together is always nice in regards to floral arrangements - and create a bigger more dominant cluster for the lower side. I am using one piece of threat for the tighter cluster but new string to attach more loosely hung ornaments. 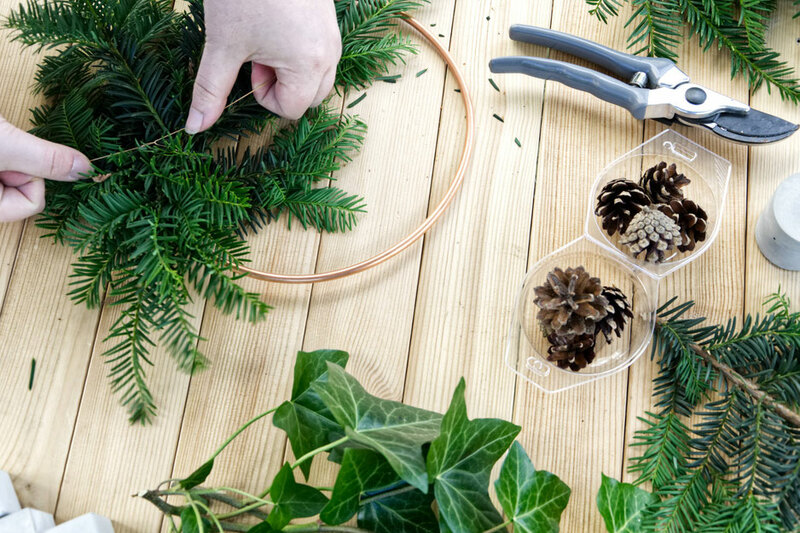 The pine cones don't have this handy wire look to string them up but I find that stringing them around the base is sufficient to attach them and it allows for a bit of movement to turn them so they display nicely. Finish to your liking but in the picture to the left I am almost done. My friend added collected and painted leaves but feathers, dried flowers or a touch of snow could also be nice. Well, I am guessing you will come up with endless wonderful designs but I hope this is inspiration to you and I for one enjoy crafting with you enormously. Tag me in on social media when you show off your design or leave a comment below - can't wait!